for us today: 1, Who is Saint Patrick? 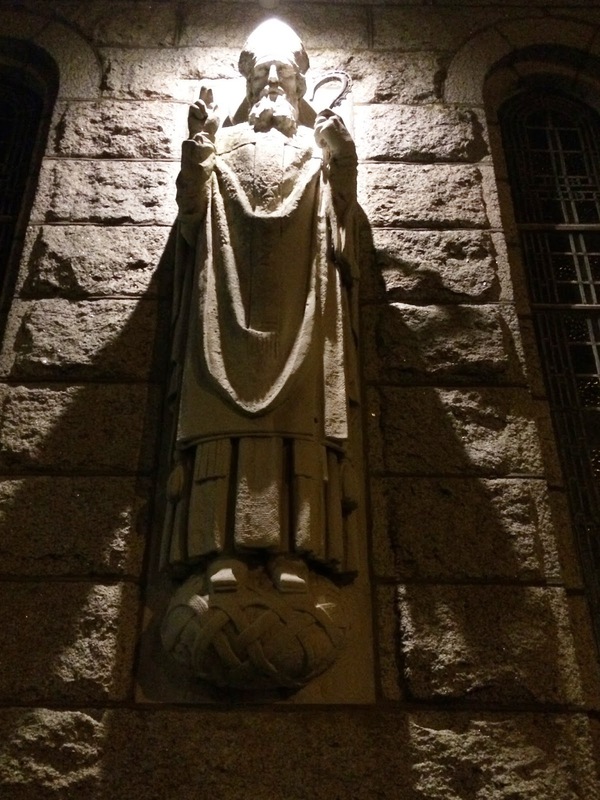 7.30 p.m.: Who is Saint Patrick? It is interesting that while we have been focussed in recent days on the inner city lockdown in Dublin that is going to effectively shut off Christ Church Cathedral and other city centre churches on Easter Day, the most important celebration in the Church. Yet, we have often passively accepted the fact that places like Saint Patrick’s Cathedral and Christ Church Cathedral are hermetically sealed off on 17 March so that only the most adroit of churchgoers are able to attend and continue the real traditions that we say were established by Saint Patrick. During the Saint Patrick’s Day festivities there will be little if any mention of Saint Patrick, his spiritual message, or the uniqueness of the experience of Christianity in Ireland and the Church in the centuries afterwards. Saint Patrick’s Day is less than a week away [17 March 2016], and most of the fun will be at parades and at fun fairs rather than churches and cathedrals. RTÉ inevitably is going to inundate us with reports on the floodlighting public buildings and monuments around the world with fluorescent green. And – inevitability – we are going to witness the quaffing of copious litres of green beer. 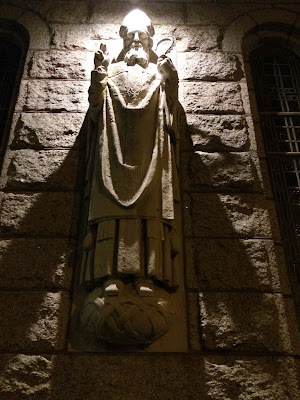 But what do we know about Saint Patrick, his life, his teaching, his writings, and his spirituality? Is there such a thing as Celtic Spirituality? Is Saint Patrick worth rescuing from the Green Beer? And is Celtic Spirituality worth rescuing from ‘Celtic Sensuality’? These are some of the questions I hope we can explore together this weekend. This evening, in our first session, I would like us to set Saint Patrick and the origins of Christianity in Ireland within the context of an Irish Christianity that predates his arrival on this island. In our second session, tomorrow morning [12 March 2016], we look in greater detail at Saint Patrick’s writings and message. In our third and session later tomorrow morning, I hope to introduce us to Celtic Spirituality, and to is there something there? We may look at early Irish monasticism; the great founders of the monastic tradition, including Colmcille or Columba, and Columbanus, and the great missionary expansion of that monastic tradition to continental Europe. And then, perhaps, we can draw all this together at our closing Eucharist tomorrow afternoon. These dates are of significance in the history of the wider Church: Saint Augustine died in 430, the Council of Ephesus met in 431, and the Council of Chalcedon met in 451. But putting aside myth and romance, it is a good starting point in Irish Church History to recognise that there were Christians in Ireland before Saint Patrick’s arrival and that his work as a missionary is only part of the story of the origins and growth of Christianity on this island. The seas provided Ireland with immediate access to the neighbouring islands and Continental Europe: the north Antrim coast and Galloway were a few hours apart, Wales was less than a day away; many parts of Continental Europe was accessible in a day or two by sail and ship; present-day Spain no less than three days away; Iceland, a journey of about 1,000 miles, was less than a week away. The “Celtic” people in Ireland were traders, raiders and plunderers, and there is evidence of Roman traders reaching Irish harbours and beyond them up rivers such as the Nore and the Barrow, trading in wine, oil and wheat. The Irish imported pottery, metal-work and bric-a-brac from Roman Gaul and Britain, and exported copper, gold, slaves, hides, cattle and wolfhounds. By the end of the 3rd century, people from Ireland were establishing colonies on the neighbouring island, with colonies in north-west and south-west Wales, in Cornwall and on the west coast of Scotland. There must have been interchange between these colonists, Christian Britons and the Roman ruling and military classes, and the traffic cannot have been all one-way either, and the return traffic must have brought some Christians to the south and east coasts of Ireland. By the 3rd or 4th century, there was regular commercial, mercantile and social contact between communities in Ireland and Roman communities in Britain and Gaul. So, for example, there have been abundant finds of looted Roman coins all along the northern and eastern coasts of Ireland: at the Giant’s Causeway (1831), Coleraine (1854) and more recently at Limavaddy; and Roman silver ingots with similar Christian provenance have been found in Kent and Limerick. Catherine Swift argues convincingly that among the ruling class in Ireland, many adopted the cultural habits of Roman Britons, to the point that they became Romanised to the point that they adopted the social customs of Roman Britain and what is now Cathedral Hill in Armagh is an example of one of their temple sites. Christianity probably arrived in Ireland in the 4th and early 5th centuries by a slow and gradual process of unplanned infiltration, from Britain and from Continental European, probably from Gaul and what we now know as Germany, and perhaps even from the Iberian peninsula (present-day Spain and Portugal). One local king, Niall of the Nine Hostages, commanded several raiding expeditions across the Irish Sea. British captives carried off by Irish raiders may be yet another way of Christianity coming to have a presence on this island. Some educated continental Christians may also have sought refuge in Ireland during the barbarian invasions of the crumbling Roman Empire, fleeing Gaul or present-day France, at the start of the 4th century, and bringing their Christianity with them. Other points of contact include contacts made by the Irish emigrés in Britain, and trade links with Roman Britain, Gaul and Spain. A gravestone for a fifth century Irish Christian has been found in a Christian cemetery in Trier, and fifth century Christians, some with Latin names, are commemorated on ogham stones in southern Ireland, in Carlow, Waterford, Cork and Kerry. There is some evidence that suggests the gradual conversion of Ireland by Britons in the 4th century and possibly early 5th century. 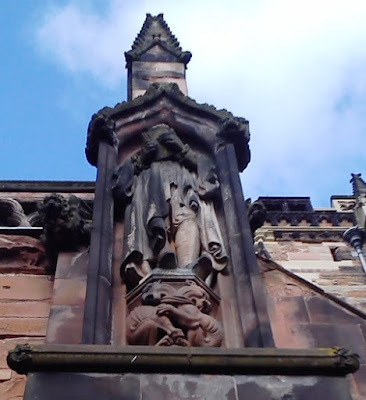 The traditional account of the life of Saint Patrick says he was born about 372 in Roman Britain in Bannavem Taburniae, perhaps in Cumbria or at a Roman outpost at Dumbarton in Scotland. He says his father Calpornius was a deacon and his grandfather Potitus was a priest; both were from a relatively prosperous class of Romans. At the age of 16, the young Patrick was captured in a great raid along with “many thousands of people” [Confessio 1]. According to his own account, some of them were lukewarm Christians, and some of them could also have been committed Christians, perhaps even priests. He was brought to Ireland and later sold as a slave. There are two theories about where Patrick was a slave. One theory is that he herded sheep in the countryside around Slemish, Co Antrim. Another theory is that he herded sheep in Co Mayo near Killala Bay, at a place called Fochill. His own account of his escape from slavery as a young man at the age of 22 may be evidence of an escape network for fugitive slaves run by concerned Christians, presumably in Leinster, more than 20 years before Patrick began his own mission [Confessio 17 and 18]. After escaping and returning to his own people, Patrick began to have visions in which he heard the cry of the people in Ireland pleading to him to come back. It is an image that may have drawn on Saint Paul’s vision in Troy of a man calling him across the sea to Macedonia (see Acts 16: 9-10). Believing he was called by God to a mission to the Irish people, he entered the monastery of Saint Martin of Tours. He was subsequently ordained a bishop in Rome, and was sent to Ireland by Pope Celestine, who died in 432. Most of the details we have of his life are from his Confessio, written in reply to the attacks on his character brought against him in England, and from his Letter to Coroticus. Patrick arrived back in Ireland from Britain around 432. According to JB Bury, he landed in Wicklow, at the mouth of the River Vartry. Bury also suggests that Patrick had escaped through Wicklow six years earlier, but offers only circumstantial evidence to support this. Tradition says Patrick was not welcomed by the local people that he was forced to leave to seek a more welcoming landing place further north. He rested for some days at the islands off the Skerries coast, one of which is still called Saint Patrick’s Island. But, is said, Patrick founded his first church in a barn at Saul, Co Down, that was given to him by a local chieftain, Dichu. There are traditions that some Irish saints preceded Saint Patrick in date: Saint Ciaran of Seir Kieran, Co Offaly (Diocese of Ossory); Saint Ibar or Iberius of Begerin, Co Wexford (Diocese of Ferns); his nephew, Saint Abban of Adamstown, Co Wexford (Ferns); Saint Declan of Ardmore, Co Waterford; Saint Declan’s friend, Saint Ailbe of Emly, Co Tipperary; Saint Meltioc or Multose of Kinsale, Co Cork; and so on. Most of these are associated with the south and the south-east, although there is no primary evidence to support these largely unreliable traditions. The legends about these saints bringing Christianity to many parts of the southern half of Ireland may be nothing more than legend. But underpinning them is a truth that Christianity was here in Ireland for generations before Saint Patrick arrived and that he was not the first person to bring Christianity to Ireland. The presence of British Christians in Ireland must have had an influence, direct or indirect, on the spread of Christianity in Ireland before 431, so that by the time he began his mission Patrick would have found the British Christians resident in Ireland forming the nucleus for his mission and his Church. Pelagius (355-425) denied the necessity of grace for salvation and emphasised God’s gift of free will to humanity. Saint Jerome vilifies him as a “most stupid fellow, heavy with Irish porridge” and claims that he, or his companion Coelestius, had “his lineage of the Irish race, from the neighbourhood of the Britons.” Perhaps Jerome was insulting his opponent, but nevertheless the possibility arises that Pelagius had Irish ancestry or had lived in Ireland. Germanus of Auxerre was sent from Rome to Britain in 429 to combat the impact of Pelagius and Pelagianism on the Church in Roman Britain. Soon after – perhaps in 431 – Palladius was ordained by Pope Celestine, and he was sent as the “first bishop” on a mission to “the Scotti [Irish] who believe in Christ.” So, we know that from at least the third decade of the fifth century, the Irish Christians were numerically large enough to have a bishop sent from Rome, and Palladius is associated with a number of church sites in Leinster. The late Professor Patrick Corish of Maynooth, in The Irish Catholic Experience (1985), links the mission of Palladius in Leinster with, perhaps, three churches in Co Wicklow. The circular letter known as The First Synod of Saint Patrick seems to provide evidence of a second-generation missionary Church in Leinster, and this stream of Christianity in Ireland has been associated with the Church in Kildare. Certainly, by the time Patrick began his mission, the foundations had been laid for a Church in Ireland that over the centuries that followed became a vibrant missionary Church. But, while the missions of Palladius and Patrick may have overlapped, Patrick does not refer to Palladius. Patrick was working in fresh territory, while Roman missionaries in Leinster were consolidating the work of Palladius and others who, by 431, had ensured that there were many people in Ireland who were Christians. In his Confessio , Patrick shows he is aware of episcopal activity in other parts of Ireland, including baptisms, confirmations and ordinations. But he says he travelled to places in Ireland “where no one else had ever penetrated, in order to baptise, or to ordain clergy, or to confirm the people” –suggesting there were places that had received episcopal ministry from other, earlier sources. So, we can surmise that Christianity had already taken root in the island before Saint Patrick began his mission. It is said Saint Patrick built 365 churches and consecrated an equal number of bishops, established schools and convents, and held synods. The sites associated with him include Armagh, which became the centre of the cult of Saint Patrick, Croagh Patrick in Co Mayo and Lough Derg on the borders of Co Donegal, where he is said to have spent time in retreat. Muirchu Moccu Machtheni, in his highly mythologised seventh-century Life of Patrick, says that Patrick lit a Paschal fire on the top of the Hill of Slane in Co Meath, in 433 in defiance of the High King of Ireland, Laoire. The story says that the fire could not be doused by anyone but Patrick, and it was there that he explained the doctrine of the Trinity using the shamrock. There is a myth that Patrick killed a large serpent on Lough Derg in Co Donegal and that its blood turned the water red. Each August, pilgrims spend three days fasting and praying on “Station Island” in Lough Derg. Needless to say, there is no historical reason to associate him with the site of Saint Patrick’s Cathedral in Dublin, or the supposed Saint Patrick’s Well at the Nassau Street side of Trinity College Dublin, or other sites such as Saint Patrick’s Church in Donabate, in Fingal in north Co Dublin, Saint Patrick’s Church in Wexford, or the many other churches associated with his name. There are four different dates for his death. Most traditions say he died around 460, although other authorities say he died sometime around 491 to 493. It is said that Patrick died at Saul in Co Down, or that his body was brought there between when he died before his burial in the grounds of Downpatrick Cathedral. Nearby, on the summit of Slieve Patrick, there is a huge statue of Saint Patrick with bronze panels showing scenes from his life. Neither the canons attributed to him nor the Breastplate of Saint Patrick is his work. Later seventh-century documents speak of Patrick as the successor of Palladius. However, the O Neill dynasty had Tireachan and Muirchu write spurious accounts of Patrick’s life to establish Armagh’s claims to primacy in Ireland. But when we consider the long run of Christian history over 2,000 years, Saint Patrick’s Day is a reasonably late innovation, dating from only the 17th century, and has only been a public holiday since 1903. Indeed, the first Saint Patrick’s Day parade in Dublin was not held until 1931. (The Revd Canon Professor) Patrick Comerford is Lecturer in Anglicanism, Liturgy and Church History, the Church of Ireland Theological Institute. This is the first address at a Diocesan Readers’ Lenten retreat on 11-12 March 2016. There are monuments to Samuel Johnson on the south-east side of Lichfield Cathedral and in Saint Paul’s Cathedral, London, a window commemorates him in Southwark Cathedral, and he is buried in Westminster Abbey. In recent weeks, I have been visiting a number of cathedrals in England and Ireland, including the cathedrals in Lichfield, London, Birmingham, Dublin, Kilkenny, Limerick and Killaloe. But what did Johnson have to say about cathedrals?